New Delhi, Dec 18: India's boxing sensation Vijender Singh is eyeing another knockout win during his double title defence against African Champion Ghana's Ernest Amuzu in Jaipur on December 23. 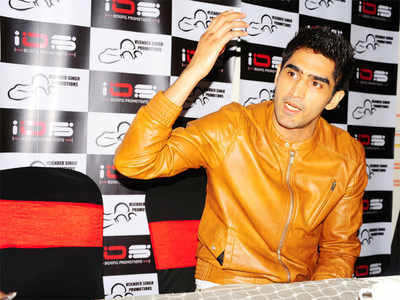 Amuzu has threatened to leave Indian star boxer Vijender Singh "beaten and broken" when they clash at Sawai Mansingh Indoor Stadium. "I know this is a mind game and before this all my nine opponents have tried same strategy but i am always focussed on my training," Vijender said. "Let Ernest do this trash talk, but I am working hard doing 10 rounds of sparring daily with different boxers.